Trailer Ball Mounts (TBMs)Hayman Reese understands that occasionally TBMs can go missing or are stolen and therefore they sell TBMs individually. Hayman Reese Interlock TBMs come complete with the TBM and Interlock Towball. As you tighten the Interlock Towball it grips the hex pattern stamped in the TBM. This means you only need one spanner to secure the Interlock Towball to the TBM and ensures you don’t strip the chrome off the towball trying to grip it. Hayman Reese has a range of standard TBMs to suit different towing applications.Note: Some TBMs can lower your maximum carrying capacity. If in doubt please call Hayman Reese Hotline on 1800 812 017. Towballs50mm 3500kg towballs rated to Australian Standard AS/NZS4177 are available. Genuine Hayman Reese towballs feature a premium chrome finish. Pintle Hooks & MountsHayman Reese has a range of Pintle Hooks at different capacities, including a combination 8 tonne pintle/towball unit. Adjustable Pintle Mounts are also available to use with Hayman Reese Class 4 towbars. 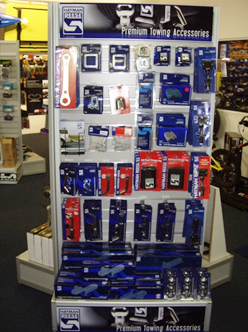 AccessoriesThere is a comprehensive range of Hayman Reese genuine accessories available, from Hitch Pin Locks to prevent your TBM being stolen right through to spare U bolts and R clips.